Not to quote their About Page but "fun sense of style" is the perfect way to describe SwayChic.com's selection. While it does stay on trend, the brick-and-mortar-tunred online retailer carries the kind of pieces that would get you noticed (especially in parts of Dallas) for being a tad funky and, well, chic. They granted me enough credit for two moderately-priced items, which weren't very hard to pick. The selection is very colorful and fun, and while the bold colors were eyecatching, I gravitated to the black. Even in this heat, it's my kryptonite. FYI, there are plenty of sheer tops and tanks for these hot summer days you'd rather be naked - like these two they just added. 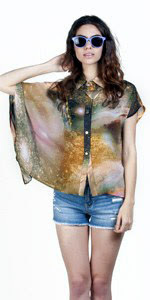 I ended up choosing the two shirts at the end: Galatic Sheer Button Up & Metallic Print Tank. I was a little worried (and disappointed) that the largest size they carried was an L because I normally wear XL. 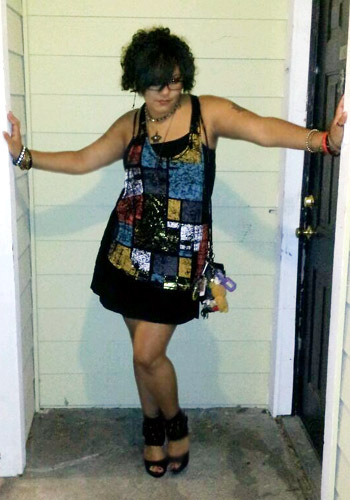 However, the tops I chose were originally loose-fitting (as is the trend) and fit really well - as you can see below. The fabric on the tank top is light and soft, which is perfect for this weather. I've gotten compliments on the asymmetry of the Galactic top but the sheer feels little thick when I'm outside. Did I mention it's the kind of summmer you spend naked? Alex told me that while cosmic shirts may be considered chic by some, this one just makes me look like a bigger nerd. Something about spending too much time reading about aliens, black holes and loving the movie Contact.